Are the dark lines around the edges of carpet permanent? You may have filtration soiling in your house or your parents or grandparent’s house and not known what it was. Filtration soiling is the black, dusty buildup on the carpet along the baseboards, or in the middle of the doorway entry to a bedroom or closet, that stays closed most of the time. 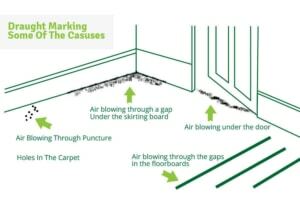 What happens is small dust particles from the dirty air duct system exit through the supply vents and follow the air path throughout the home. Filtration soiling takes years to become noticeable in most cases. The good thing is, contrary to what your last carpet cleaner told you, these lines are not permanent. They just don’t usually come up with a regular steam cleaning. Soot lines. Filtration soiling. There are many names for it. And yes, The Carpet Chemist can remove them. We carry special soot removal bars and equipment on our vans for this very common carpet soiling issue. The reason most carpet cleaners tell you it’s permanent is because you have to crawl around on your hands and knees and vigorously scrub these dark lines by hand. The Carpet Chemist says: Having your air duct system professionally cleaned and sanitized every 3 to 4 years will eliminate filtration soil lines on your carpet. Having your air duct system professionally cleaned and sanitized every 3 to 4 years will eliminate filtration soil buildup lines on your carpet. Regular vacuuming ( at least twice a week), including using that crevice tool that comes attached to your vacuum cleaner, will help keep your carpets looking their absolute best. And as always, we highly recommend having your carpets professionally steam cleaned 1-2 times a year, depending on the amount of traffic coming and going in your home. Upload a pic of your stained carpet for an instant quote. Our IICRC-certified team provides no-obligation estimates. Connect with our team at (800) 515-1342 or by using the secure form below.